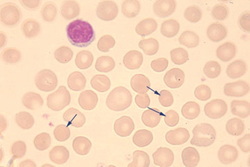 Pathologically hereditary spherocytosis may present with sphere shaped erythrocytes. The erythrocytes may present with no central pallor. The morphological appearance of the hereditary spherocytosis is detected from peripheral blood film/peripheral blood smear. The blood analysis may reveal increased MCHC (mean corpuscular hemoglobin concentration), increased in the osmotic fragility ( erythrocytes), normal hemoglobin, normal MCV ( mean corpuscular volume) and reticulocytosis. Hereditary spherocytosis may present with the common signs and symptoms such as jaundice and hemolytic anemia as well as enlargement of the spleen or splenomegaly. Hereditary spherocytosis is an autosomal dominant disorder. This autosomal dominant disorder will cause defect in spectrin which is a defect in an erythrocytic membrane protein. Patient who suffer from hereditary spherocytosis should be treated with splenectomy/removal of the spleen. 1.Perrotta, Silverio, Patrick G Gallagher, and Narla Mohandas. “Hereditary Spherocytosis.” The Lancet 372, no. 9647 (18): 1411–1426. doi:10.1016/S0140-6736(08)61588-3. 2.Bolton-Maggs, P. H. B., R. F. Stevens, N. J. Dodd, G. Lamont, P. Tittensor, M.-J. King, and General Haematology Task Force of the British Committee for Standards in Haematology. “Guidelines for the Diagnosis and Management of Hereditary Spherocytosis.” British Journal of Haematology 126, no. 4 (2004): 455–474. doi:10.1111/j.1365-2141.2004.05052.x.